I had been tinkering with a recipe for granola using cranberries, orange, cardamom and pecans. When I finally got it the way I wanted, I liked it so much I decided to find several ways to use it. 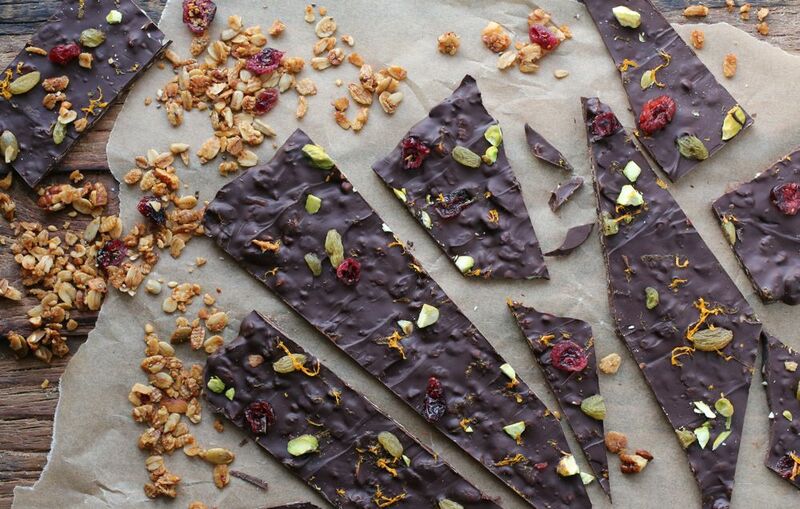 This Granola-Chocolate Bark, an inspiration from Food and Wine, came to mind. 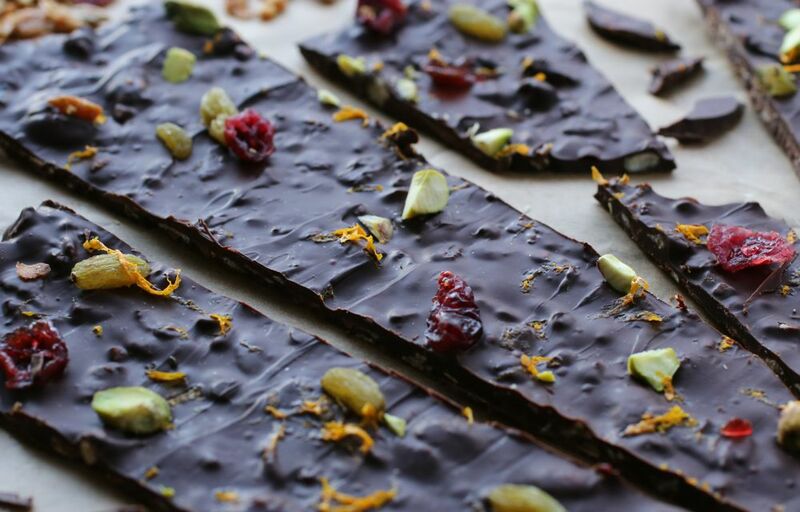 Everyone who has tried this bark so far describes it simply as “divine”. It’s easy to make and you can easily tailor it to your taste and texture preferences. 1 pound semi-sweet or bittersweet chocolate (60%-70% cocoa), finely chopped (use vegan chocolate if preferred). Line a large baking sheet with parchment paper. Melt chocolate in bowl set over a saucepan of simmering water. Stir until melted and smooth. Add granola and mix into chocolate. Spread onto baking sheet in a 1/2-inch-thick layer. Sprinkle with pistachios, golden raisins, cranberries and orange zest. Let bark cool to room temperature, then refrigerate until firm. Cut and serve. Notes: Use the highest quality chocolate you can find and afford. I normally use the brand “Callebaut”. I buy it from my local Whole Foods. 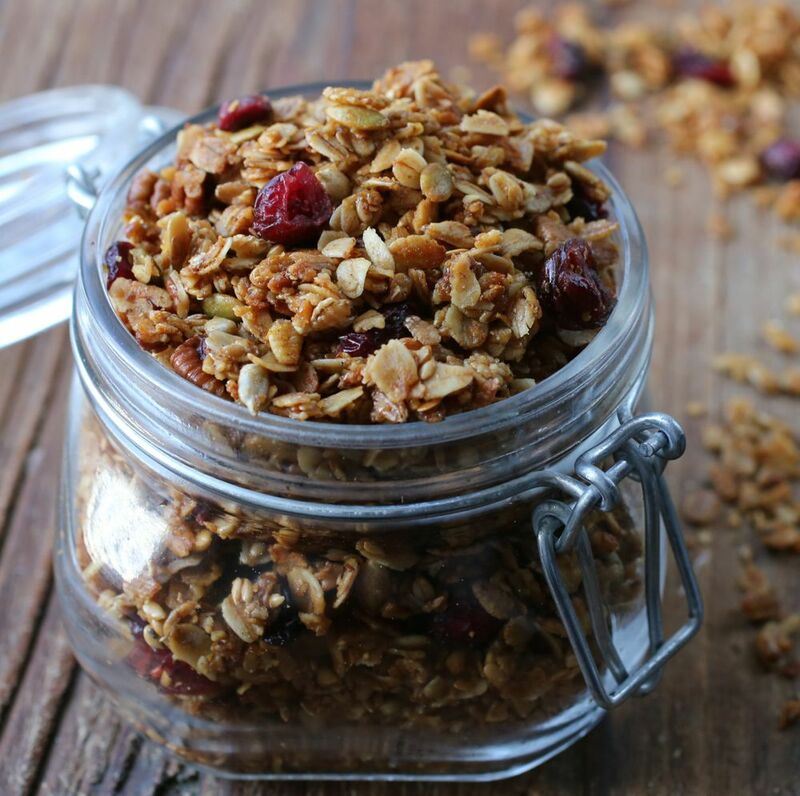 If you like, for a chunkier texture, feel free to add more granola, nuts, and dried fruit. Preheat oven to 325F. Combine dry ingredients (oats-salt) in a large bowl. In another bowl, combine wet ingredients, coconut oil, honey (or maple syrup or agave), orange zest and orange oil. Add wet ingredients to the dry and toss well to combine. Spread on to a parchment lined baking sheet. Bake for about 20 minutes, stir and continue baking until golden, about 15 minutes longer. Remove from oven. Allow to cool in pan. Toss in dried cranberries. Notes: In non gluten free versions, I’ve used kamut flakes, red winter wheat flakes or barley flakes instead of some of the oat flakes, buckwheat, and quinoa flakes. Feel free to adjust the recipe, substituting grains, seeds (I’ve also used hemp and/or chia seeds), nuts, and dried fruits, if you like. 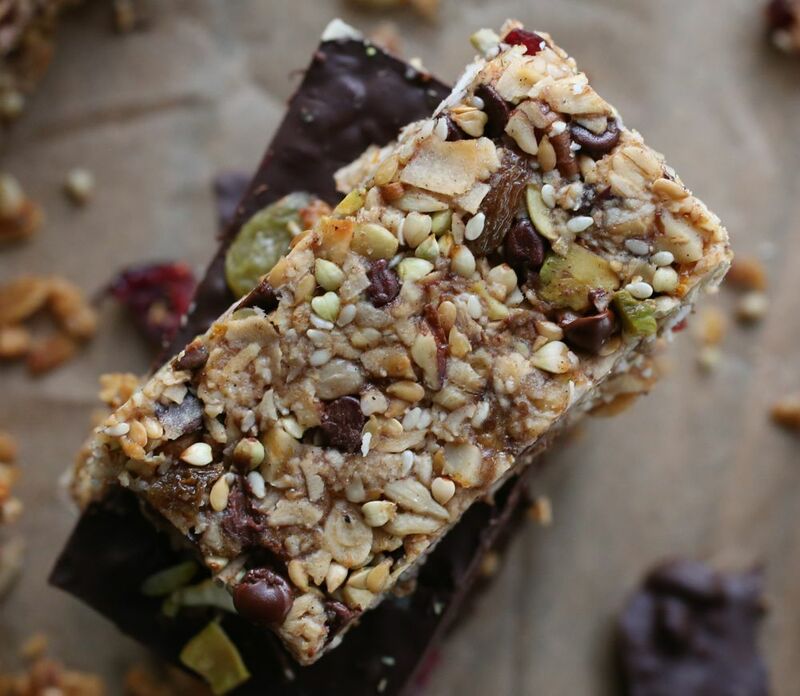 I was also inspired to make these granola bars using the same flavor profile. Preheat oven to 350F. Creating a sling, line an 8″x8″ or 9″x13″ baking pan in one direction with parchment paper, allowing the paper to go up the opposing sides. Do the same in the opposite direction. This helps to remove the bars from the pan after they’re baked. In a separate bowl, combine the wet ingredients. Mash the bananas, add coconut oil, maple syrup, orange zest and orange oil (or orange extract). Combine the wet ingredients with the dry mixture and stir them together until the dry ingredients are well coated. Spread batter evenly into prepared baking pan, pressing firmly into the bottom, edges, and corners. You want to make sure the batter molds to the shape of the pan. Use a plastic wrap (cling wrap) as you press so the batter doesn’t stick to your hands. Bake bars until they’re brown around the edges, about 30-40 minutes. Cool in the pan on a cooling rack or in the refrigerator. Once they’re cool, use a serrated knife to cut the bars into squares. You can also cut them cold by chilling them in the refrigerator an extra 30 minutes if they seem too crumbly.